Massaging the kale? Yes, try announcing in your home that you busy are massaging the kale, so dinner will be ready in a few minutes…..and yes there will be resentful comments from some members of the family….but these same disgruntled folks will not only be super happy when they eat the massaged kale salad, they will ask for it again and again 🙂 The massaged kale, the fresh summer vegetables and fruit and the coconut curry dressing make every bite of this salad memorable! I got a mix of fresh baby spinach and kale leaves and used coconut oil, salt and curry powder for the massage. All you do is rub the leaves with this mixture for a few minutes and you will see the difference in the texture, aroma and the taste! I grew up eating coconut and foods made with coconut oil and absolutely love the flavor. But if you don’t, you can use extra virgin olive oil too. For the coconut curry dressing, I put together ingredients that I love, and am very happy with the result. I am going to make a bigger batch next time because I was licking the plate clean 😉 For veggies and fruit, I used carrots, red cabbage, yellow peppers and grapes. Peanut butter and the toasted walnuts give the salad that extra oomph! For the kale massage- 1 teaspoon of coconut oil combined with sea salt and ½ teaspoon curry powder. 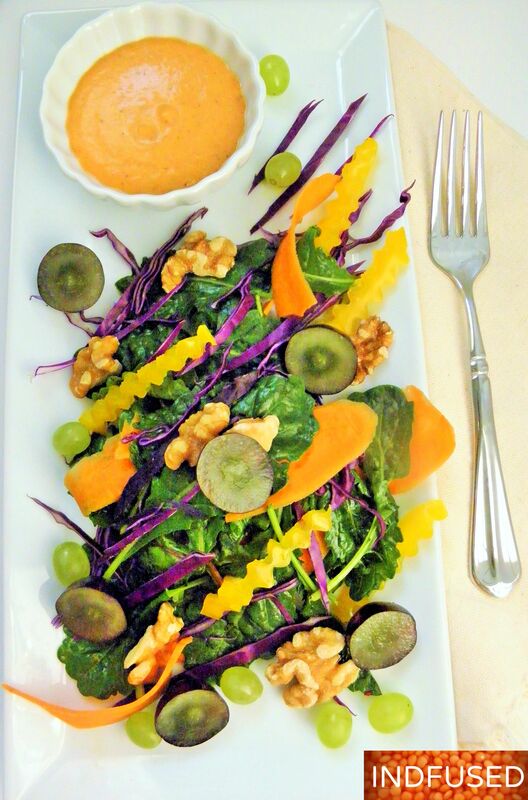 For the salad – Baby kale and spinach leaves, yellow pepper, carrots, red cabbage, grapes, toasted walnuts. Heat the 1 teaspoon oil in a pan over medium heat. 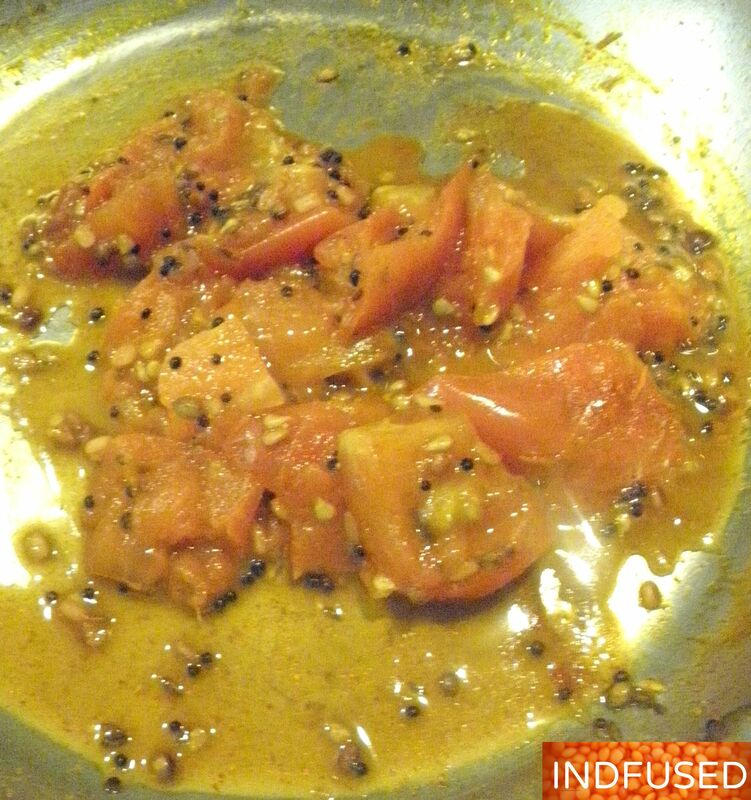 Add the mustard seeds, cumin seeds and urad dal. When the seeds begin to splutter and the urad dal is a golden brown, add the asafetida, chili and turmeric powders and stir for a few seconds, taking care not to burn it. Add the tomato chunks and the sea salt and stir fry it over the spice mixture for a minute or so. Add ½ cup of the water, reduce the heat, cover the pan and let the mixture cook together until the tomatoes are soft and mushy. Remove from heat and let the mixture cool slightly. Grind the mixture with the remaining ½ cup of water, peanut butter, brown sugar, lime juice and coconut milk powder added to the blender. The dressing can be made ahead of time. Cool the dressing in the refrigerator. It may thicken after cooling and can be thinned with some water if needed. Remove the stems of the washed and dried kale. I used baby kale and baby spinach leaves, so did not need to remove any stems. Massage the leaves with the coconut oil mixture for a few minutes to gently rub in the oil mixture. Set it aside for about 10 minutes. Combine the massaged leaves with the veggies and grapes, top with the walnuts and serve with the dressing! It never occurred to me to massage kale! The salad and dressing sound great! I have all the ingredients except the kale and the grapes and I will get those tomorrow. I’ll make a small batch for myself the first time since Faye is still on a bland, recovering from surgery, diet. I’m sure it is something she would enjoy another time. Massaging the kale really made a huge difference in the texture and taste of the kale, Greg . I hope Faye’s recovery goes smoothly and she enjoys the salad soon! Interesting idea, massaging the kale. Thank you Ronit! Massaging the kale did wonders to its texture and taste. I am addicted to it now! Massaging the kale really makes a huge difference in the texture and taste. Massaging the kale really helps with the texture and taste of kale. Thank you so much for your kind words! This looks so colorful, healthy and beautiful! Thank you so much Kushi! What a healthy treat here Sandhya. Just so colorful and vibrant. Love the coconut curry dressing, you’ve got it all there in one sitting. The vegetables must add a nice crunch to it. Just gorgeous! Thank you Loretta! I am happy that my husband also loved it as much as I did, so I will be making it often. The summer veggies and fruit are so delicious, right? Thank you Antonia! Yes the kale tastes amazing after massaging it! I procured the ingredients I was missing for the salad today and just finished making the dressing this evening. It tastes wonderful! can’t wait to have it with the salad tomorrow. It’s taking all my willpower to not drink the dressing right down! Thank you so much for letting me know, Greg! You made my day! I loved that dressing too. Thank you so much Greg! really appreciate the shout out! I am going to make these awesome purple yam oven fries. They look awesome. Thank you so much Soniya. I really appreciate your kind words.